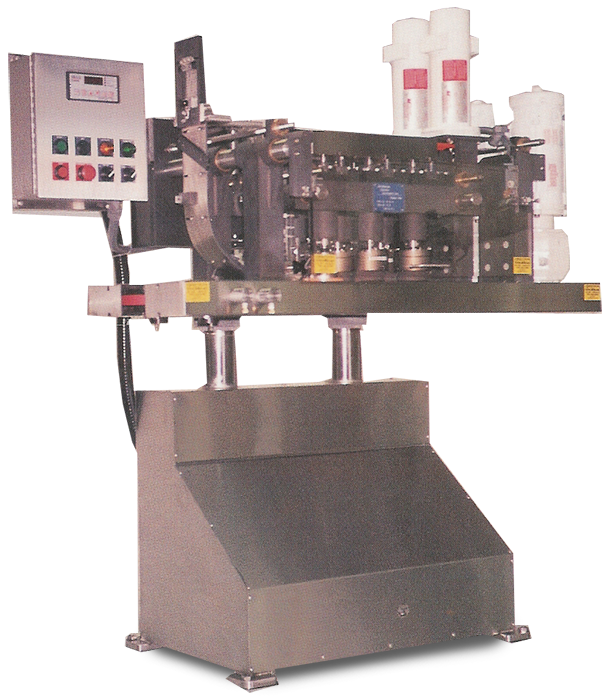 The Diversified Capping Equipment, now Dillin Capping Systems, Model 132-100 In-Line Spin Capper is designed to apply continuous thread or lug caps to glass and plastic containers. Filled containers pass through the capper on a conveyor that can also be provided by Dillin. Non-marking side belts grip the containers. The leading edge of the container pulls a cap from the cap feed chute as it is conveyed. After the cap is picked up, the container travels forward under the cap leveling plate, where it is leveled and simultaneously spun on finger-tip tight by means of a pair of primary cap starting rolls. The container then passes through two more pairs of cap tightening rolls, both clutch controlled, for final tightening.